There’s something to be said about preparedness and individual readiness so as not to be caught by surprise. Better management of our time, and more attention given to proper planning would yield great dividends. It’s been said, “The greatest possession you have, is the 24 hours directly in front of you.” How then, do we make full use of our most prized possession? Wouldn’t it be wise to say ‘yes’ to planning and ‘yes’ to responsibility? Everything that our Lord saw on earth reminded Him of the kingdom of heaven. For example, He compared the kingdom of heaven to a mustard seed, a vineyard, a hidden treasure, a fisherman’s net, a farmer, and ten virgins. “The kingdom of heaven would be likened to ten virgins who took their lamps and went to meet the Bridegroom. Now, five of them were wise, and five of them were foolish” (Matthew 25: 1-12). I don’t know about you, but this story got my attention. If the each of the ten virgins’ character was blameless and without reproach, why then, were they not all welcomed in? Each had a lamp, each slept while waiting for the Bridegroom. At midnight, all were awakened, and all arose when it was announced that He, the Bridegroom, was coming. In this parable, Jesus directs us to the contrast between the preparedness of the spiritually faithful, and the unreadiness of the faithless, and instructs all to be ready. The main lesson learned out of this whole story is that five of the virgins were wise and took along extra oil for their lamps, and five were foolish and took none. What is it that makes one’s heart so dark, so depressed, and so unready at times? Why is there so much turmoil within? Why is your spiritual experience so dreary and so decayed, when it should be full of rejoicing as if your whole life were one continual preparation for your wedding? What is really the matter with you in your heart? Is it possible that there is a lack of preparedness and readiness in your life? The lack of the Spirit of God in one’s life makes for a swelling of darkness and fatality. When you have God’s Holy Spirit in your heart, you make every habitation in which you live a commemoration. Your face will shine radiantly with a heavenly luster, and you will reflect life, love, and splendor everywhere you go. No question then what the oil is, and when you have it, there is the evidence of light and life, and that will withstand the test of time. 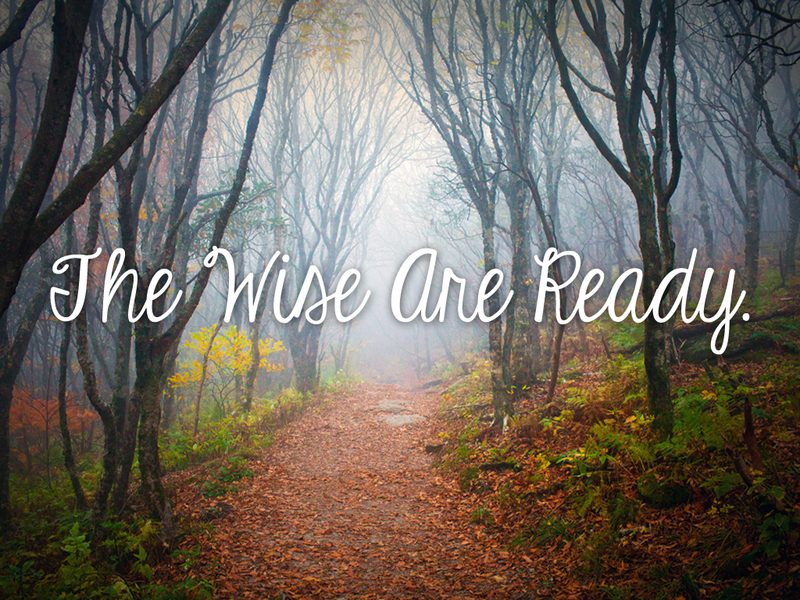 In Luke 11:9-13, Jesus’ message is clear: His coming, like that of the bridegroom in the parable, may be delayed; and the wise that follow Him need to be continually prepared. This is not a time for sluggish indulgence, for it may prove to be ruinous. A lack of preparation and lethargic indifference ultimately could be to your peril. This oil cannot be borrowed; it must be bought of Him who alone can sell it. Go all of you to Him who sells, and buy for yourselves, and you will be wiser in this divine market. There is no place or no time like the present; the oil, His spirit, is only bought in prayer. Go in good time before darkness falls, for tomorrow it could be darker still. We now have this time of grace to go to the “oil market” and buy of Him (Rev. 3.18). For you do not want to be found lacking, trying to get from a man what no mortal can give (Mark 10:21). Do not put off today, but begin at once to live in the Spirit till you experience your heart is full of His holy illumination. Men may use the right means at the wrong time and miss their moment of opportunity. They were earnestly seeking and running breathlessly when they should have been rejoicing. Those that were ready went in; those that were getting ready were shut out… the foolish virgins were too late. “Lord, Lord, open up to us,” was their plea. “I do not know you,” was His reply. Their virgin names did not save them. Why not shut the door upon God and yourself tonight, for it is better to be shut in, than to be shut out. Some time well spent in secret prayer will take care of what’s distracting you. And once more, watch your preparedness, readiness, and time, for the unwise will be found playing the fool and wasting the provision that was provided for them. What you need is time well spent with Him, for it’s the prepared that will be welcomed in.